Co-director Petra Epperlein returns to the former East German city she grew up in to try and unravel the mystery of her father's suicide and to determine if her father was working for the STASI. 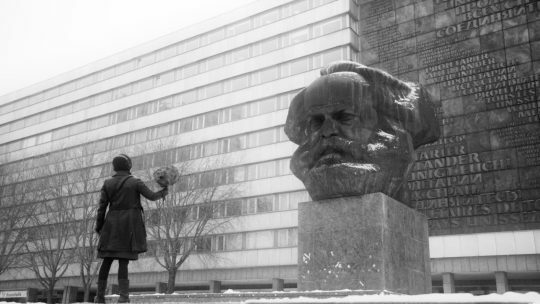 More essay and meditation than straight on documentary KARL MARX CITY is for much of it's running time an intriguing portrait of what life was like in the former communist nation. Through interviews with experts and people who lived through it we get a real sense of what it was really like in the bad old days. This wasn't what Hollywood gave us but something more evil and damaging as the state tried to have everyone spying on everyone, It's an eye opening experience. The problem is the film bogs down for a while as Petra waits for her father's STASI file to be pulled together. While the STASI recorded everything their filing system was such that all the information was kept in many places and it can take months to pull it all together. To fill the void we watch as Petra wanders the city with a microphone in her hand. Things slow to a kind of crawl. When the film ended many applauded. I tried to wake up. While the film pulls most of it's threads together in the end, there is a little too much navel gazing for my tastes. Though I do like that when things are revealed that there are no hard and fast conclusions. Things are still in flux and there are still questions to ask and emotional sorting to do- for the people on screen and in the audience.